We’ve all heard of self-talk, but allow me to introduce a different kind of internal narrative that can be just as negative as your self-talk. It is the internal talk about your spouse! The things you say, whether out loud or in your head, greatly influence the way you feel and act. In fact, Proverbs 18:21 says “the tongue has the power of life and death”. In other words, when your inner spouse-talk is constantly pointing out your husband’s flaws or rehearsing the past ways he’s let you down…your words reinforce a negative attitude and behavior toward your husband. If not corrected, this negative attitude and behavior on your part can eventually lead to prolonged bitterness, depression, and even the death of your marriage. Ladies, we must do what the Bible says in 2 Corinthians 10:5…”take every thought captive”. Start noticing the things you are saying in your head about your husband. If a negative thought enters your mind, don’t give it room! 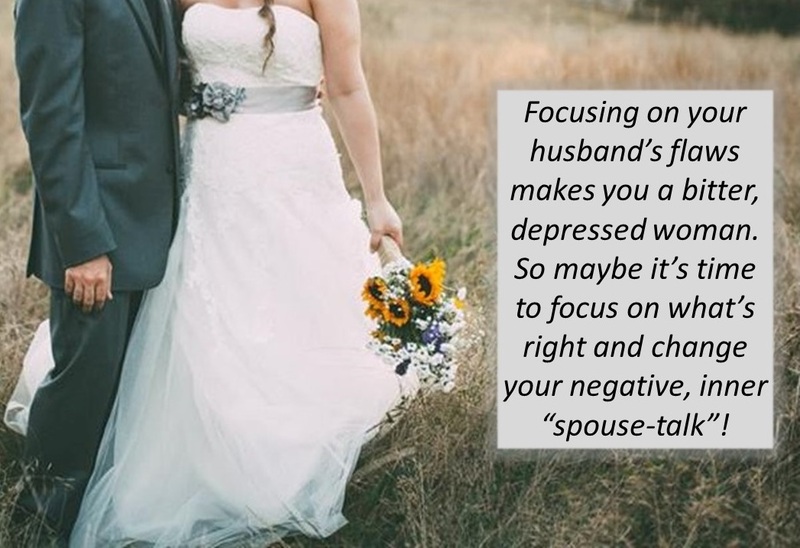 Instead, look for something positive to say about your husband. He DOES have some positive qualities. Make sure you spend time engaging in positive inner spouse-talk more than the negative kind!